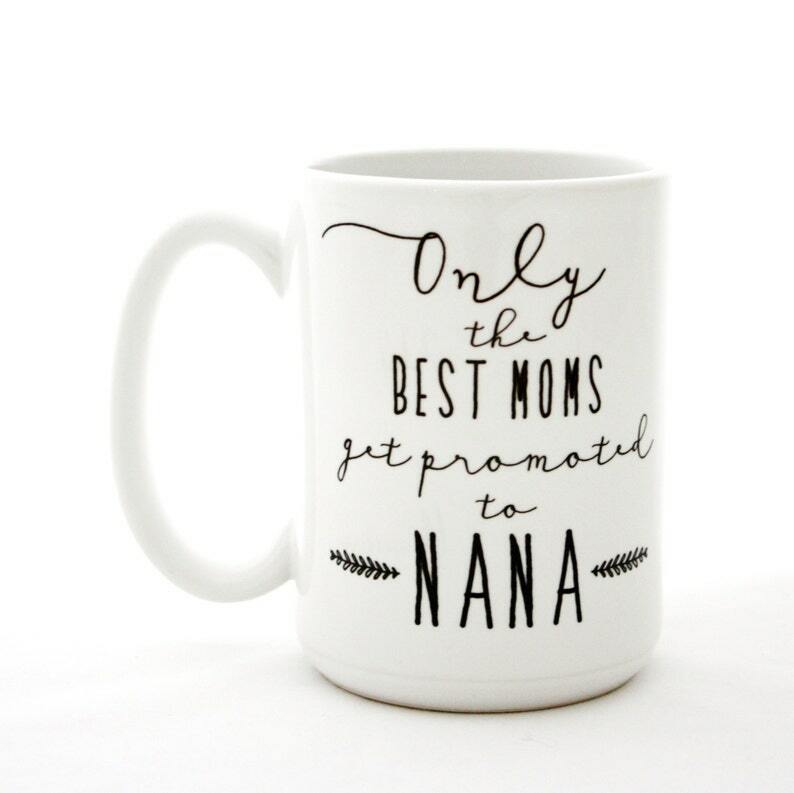 Ceramic coffee mug tells her, "Only the Best Moms Get Promoted to Nana". Would make a lovely Mother's Day gift, or a fun way to tell her she's going to be a Nana. 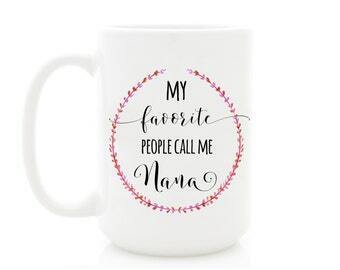 I can customize this mug by using any word you like in place of "Nana". Just leave a note at checkout telling me what name you prefer. Your choice of 11oz or 15oz size. Dishwasher and microwave safe. Get 10% off your order when you spend $100 at this shop. Discount shown at checkout. Coffee Mug. Only The Best Moms Get Promoted to Grammie. Mother's Day mugs by Milk & Honey. Mother's Day mug. 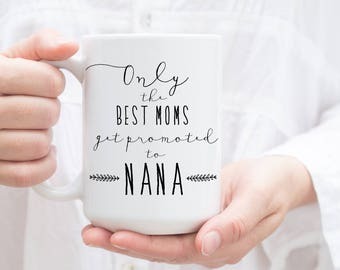 Only The Best Moms Get Promoted to Grandma. Lettered Mugs by Milk & Honey. Coffee Mug. Only The Best Moms Get Promoted to Nonna. Mother's Day mugs by Milk & Honey. Only The Best Dads Get Promoted to Papa. Father's Day mug. Graphic Mugs by Milk & Honey. Coffee Mug. Only The Best Moms Get Promoted to Grammy. Mother's Day mugs by Milk & Honey. This mug arrive and it is beautiful. fast delivery, just as pictured! Our specific processing times are listed within each listing, but most items are ready to ship in 1-3 business days. Please keep in mind that during peak holiday seasons (Valentine's, Mother's Day, Father's Day, Christmas) we may need to increase our production time and will be unable to rush production to ship ahead of schedule. When we increase our production time, it is always reflected in the official shipping section of each listing. I'm Sending This as a Gift. Can You Include a Gift Note? Tell Me About Your Mugs. 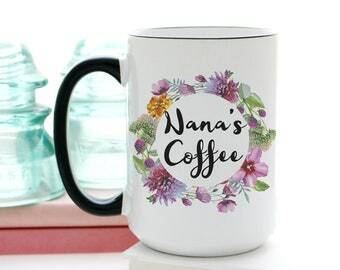 Our mugs are designed by Sarah, then individually hand pressed in our home studio using professional grade sublimation equipment for a dishwasher and microwave safe finish. The design is printed on both sides of the mug, so they are perfect whether you are right handed or left handed. (The only exception is mugs with long calligraphy swashes that wrap around the side. Printing on both sides would cause these swashes to overlap). We offer both 11oz and 15oz sizes as well as two color options (an all-white mug and a white mug with black handle & trim). Each mug is carefully shipped, double boxed with a sturdy white gift box and insured against damage. Tell Me About Your Silverware. We source the highest quality antique and vintage silverware, using only table-ready pieces with no pitting or plate loss. We never use “craft-grade” or “shabby” flatware. Our silverware is authentic vintage silver-plate, not reproductions. We hammer in every letter one at a time by hand, never with machine presses or engraving equipment. The resulting impressions are a permanent feature of the silverware, so our nearly million hammer blows of experience come in handy to be sure every letter, punctuation, and heart ends up exactly where we want it! Hand washing is recommended to protect the silver plating. Silver naturally tarnishes when exposed to oxygen, but you can easily remove tarnish and restore shine by using silver polish. Tell Me About Your Wood Products. We source our cutting boards here in the Virginia countryside, working with a local company with nearly a century of experience in wood making. We choose beautiful maple and cherry hardwoods, then precision engrave our custom designs onto them in our Virginia studio. We do not use chemicals, stains, or varnish on our cutting boards. Since we make each one ourselves, we can offer a limitless number of personalization options and love collaborating with our customers to create a special piece just for you. Our cutting boards are hand-wash only. Please do not submerge or place in dishwasher. What Silver Pattern Will I Receive? We have many individually photographed pieces that show you the exact piece you will receive. Our made-to-order listings will vary depending on what patterns are in the studio when you order. We are very careful to stock only table-ready silverware with no plate loss or pitting, never using “shabby” or “craft grade” silverware. We also curate a wide assortment of styles, so if you have a personal preference (floral, simple, masculine, etc. ), please let us know in a note at checkout and we will choose the perfect piece. While we are happy to send you photographs of silver styles to choose from, this does delay the production process by a few days and we will need to update your ship-by date to reflect this. My Mug Arrived Broken, What Now? In the rare instance that a mug arrives cracked or broken, we will replace it for you at no charge and handle the insurance claim with the postal service. USPS requires us to send a photograph of the broken mug and the original packaging. If you could please send that to us at your convenience, we will then get right to work shipping you a replacement mug. I Don't Want To Pay Customs Fees. Can You Mark the Package as "Gift"? I'm sorry but we are unable to honor requests to falsify customs documents. 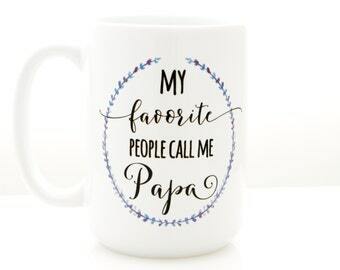 Father's Day mug. Only The Best Dads Get Promoted to Grandpa. Quotes on Mugs by Milk & Honey. My Favorite People Call Me Papa. Father's Day mug. Calligraphy Mugs by Milk & Honey. Good Morning Handsome Coffee Mug. Gift idea for him by Milk & Honey. Statement Mug. I Love You to the MOON & Back. Mugs with sayings, Valentine's Day Gift idea. Good Morning Beautiful mug. Gift idea for her by Milk & Honey. Dishwasher safe. 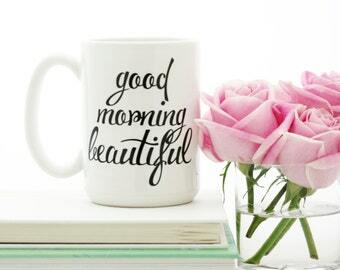 Good Morning Beautiful coffee mug. Lettered typographic calligraphy mug. Gift idea for her by Milk & Honey. 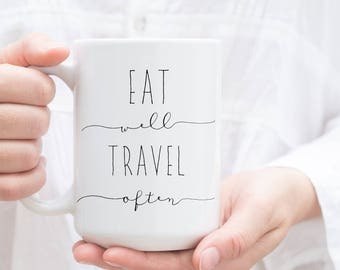 Eat Well Travel Often Mug. Inspirational Coffee Mug for travel lovers and world travellers.